We’re Celebrating 75 Years of Caring! David Fell, Board Chair and Gwyneth James, 2016 Campaign Chair of United Way Peterborough & District unveiled a special anniversary logo today on the United Way front lawn on Stewart Street and announced the launch ’75 Years of Caring,’ a year-long celebration of the organization’s 75th Anniversary. CEO, Jim Russell noted a caring community of volunteers and donors has contributed to the success of the past 75 years, raising over $71 million for our community. “As we embark on this year of celebration, we will reflect on the impact that has been made possible by your support,” said Russell. Throughout the year, United Way will be having several momentous occasions of celebration they would like you to join, a Birthday Party Campaign Launch September 20th and a Celebration in November, among others to be announced. In addition, some familiar faces were at today’s announcement. Russell introduced, Chair of the 75th Celebration Committee, Len Lifchus. Lifchus served the United Way movement for 25 years, including a decade as CEO, United Way Peterborough from 1999 to 2009, and most recently as CEO, United Way of Burlington and Greater Hamilton, where he retired in 2014. He is thrilled to be working closely with UWP again in this role leading the 75th Celebration, “It’s indeed a pleasure to bring together people from the past that I worked with and celebrate 75 years of making a difference to the city and county of Peterborough,” says Lifchus. The details of the 75th Celebration will be posted here once they are finalized. 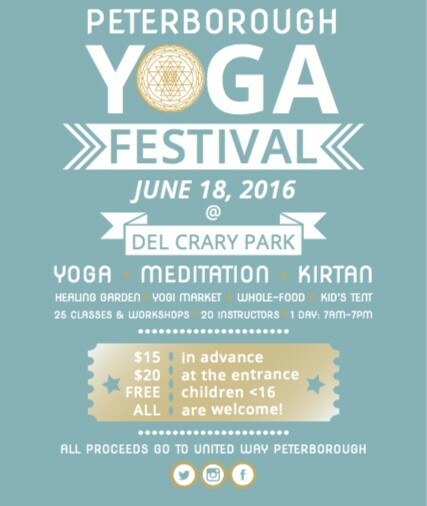 Join us at the 2nd Annual Peterborough Yoga Festival. Visit Peterborough Yoga Festival Website for line up and full schedule details. Building strong organizations and community leaders through professional development opportunities tailored to meet the needs of the non-profit sector. In partnership with local experts United Way offers high quality capacity building opportunities at low cost, to enable participants to return to their workplace with new knowledge and skills applicable to the work they do.